Walter Benjamin, essayist, literary critic, philosopher, was one of the most illustrious victims of the Nazi horrors that consumed so much of value in mid century Europe. Benjamin in the late 30s and early 40s was engaged by the Institute for Social Research in New York to write reports for them upon the literary situation in Europe. This report, written in March 1940, was the last of them and until now has remained unpublished in English- however the New Left Review has just published a translation from the French and now after all these years Benjamin's last reflections upon the literary scene of a Paris just about to fall to the Germans are available for us all to read. These reflections concern naturally a series of literary figures who have now vanished, one might ask therefore, whether unless one was to attempt a rehabilitation of these lost figures there was any point reading Benjamin's essay upon them- I think there is and hope here to suggest that there is something of universal application in the master's last survey of European literature. What strikes any reader instantly is the thickness of the letter- as I said it is filled with forgotten names. Charles Ferdinand Ramuz, Michael Leiris: these are shadows that have vanished from most people's histories of the world- and whilst they still may perhaps live locally in France to universal histories of European literature they are something less than a footnote. Benjamin though obviously knew them well- and reading this is to read a geography of the period as the axe was about to fall upon French civilisation. What you get is a geography- one might even say an ecology- of the world before the fall of everything. Benjamin relates all these figures to each other and to the greater figures outside his narrative, to Freud, to Jung, to Lautreamont and lastly to the void which was Hitler. The fascination of this essay lies in its picking over particularity: Benjamin gives us a sense of the landscape of 60 years ago, so vital that we could almost be there in the salon hearing the argument. But there is more to this, with his acute eye he also suggests ways in which the movements of these obscure figures suggest wider movements- greater intellectual arguments taking place. For example, he isolates surrealism's hostility to the very notion of positivism and hence to Freud, but shows that surrealism, incapable of a true metaphysical theory, has retreated to using Freudian language whilst condemning Freud and in the search for a guru surrealists have alighted on the figure of Jung. His discussion of surrealism moves us on though to something which I think is very interesting about this essay- which is the way that Benjamin moves into discussing Hitler and Naziism. He begins with violence: which is something that binds together the surrealism of Paris with the Nazi movement. Benjamin argues that the exaltation of violence, mindless animal and vindictive violence is ssomethng that unites Naziism with surrealism. This 'physiognomy of Hitlerism' is something he detects in the salons of Parisian intellectual life and is a useful warning to us about the ways that to celebrate violence is to take part in a project of collaboration with Fascism (theres is a distinction between celebrating violence and celebrating defence incidentally). Violence rests almost always on justification and Benjamin finds the justification of Naziism in Spengler. Oswald Spengler wrote a now forgotten but at the time very influential book called the Decline of the West. In it he did emense violence to history, twisting it as Benjamin argues into the form that would justify Nazi ideology and the justify the universal hatred between races that formed a pillar of Nazi thought. Spengler's arguments are odious and almost universally incorrect: but as Benjamin notes they were not opposed at the time, 'The intellectuals, as always, were the first to acclaim the builder of their own scaffold.' This sad observation and the argument that French intellectuals had been equally hospitable to the coming of Fascist thought in their Parisian salons is something that should not make us feel waves of self congratulation, rather it should be a warning to us that we too may encourage a viper of intellectual barbarism without knowing it, we need to be on our guard against our own minds. This is a fascinating essay- I am not enough of a Benjamin expert to place it in the context of his thought- but there is so much here of wonder- where he talks of the beauty and effect of literature that I hardly think that matters. It is an essay everyone should read for the recovery of the time just before the violence of war past over the cultural world of the thirties- as a warning from history of the beauty that can be devoured and the danger of nourishing fascist thinking. Should America have fought the War of Independence? Matt Yglesias on his blog argues that the creation of the United States might well have been a mistake- that it would have been better for the Americans and British to have found a compromise and resolved their differences. It is an interesting argument. If you think about it, the UK and US and Canada all historically and presently have shared various ideals. We fought the Kaiser and Hitler together, were members of NATO and are allies in the War on Terror. We also support free trade, support international organisations like the WTO and generally are allies in the councils of most international bodies. The war between the Atlantic cousins has seemed to more illustrious men than even Matt Yglesias to have been a folly, Churchill lamented the split as did Conan Doyle. The world of Anglo-American union might have been a much better one- in which American strength came quicker into Europe to stop Naziism and Communism and British participation brought America to an earlier prominence. But that presumes that everything went fine and that's the main problem with Yglesias's scenario. Go back to 1776 or even to 1780, let us say a deal was done. What would be the likelihood of every American accepting it? Furthermore what would be the likelihood of the deal holding? I can imagine scenarios in which a long protracted guerilla war poisoned the atmosphere. Furthermore what is the likelihood of Britain and America together being as successful in colonising the entire continent as the US was- would the Louisiana purchase have happened, would Spain have been left alone to fight for Florida or Mexico for Texas- would continental American expansion been diverted by European rivalries as say Oklahoma was swapped for Schleswig Holstein (don't laugh, France in 1763 swapped Martinique for Canada with Britain and the British were furious that they had got the worst of the bargain), would Russia say have hung on in Alaska instead of selling it to the new Republic? Such an outcome would have made every expansion of America a question of European politics, not merely of American politics. In a sense it was the war of independence which made the Monroe doctrine possible and furthermore the Monroe doctrine, supported tacitly by British naval power, that made the expansion of the US possible. There is another vast issue: in 1806 Britain abolished the slave trade- with the Southern states, the British could either have not abolished the slave trade or could have started a new American civil war, sixty years before the one that happened. And who could imagine what the result of that would have been? Every moment in history depends on an infinite various lattice. Without America's creation would say great Anglo-Americans like Winston Churchill have ever been born not to mention such exclusively American or English personalities as Lincoln, Gladstone, Feynman, Elliot, Attlee or any of the rest of those that have inhabited the last couple of centuries and whose lives were predicated on the division of the two states. The problem is that reading back to 1776 involves so much guess work that even if we could prophesy that the effects of peace would have been good in the 18th Century, the effect of chaos is such that prediction of what Anglo-American union would have meant in the 19th and 20th centuries is a ridiculous parlour game. My suspision for what it is worth is that early independence made America turn paradoxically into an early ally for the UK, and furthermore that early independence strengthened the US- by emancipating it to singlemindedly pursue continental expansion. We can and shall never know- but we should always remember that whilst the union of the two Atlantic democracies might sound attractive- the reality could have been much much worse than the world in which we live today. Conjectural history is always attractive, but nothing within it is certain- if history teaches us anything, it is that human politics are chaotic and even the most prudent minds are unable to accurately construct the future, let alone an alternative past. Ian Appleby is entirely right when he suggests that it does not diminish a story when we try to understand its ideological and philosophical messages. Stories are wonderful ways of capturing ideas and taking us through them: if you think, as I do, that empathy is one of the most outstanding and underrated of intellectual faculties then you cannot but see stories as a vital form of communication. Understanding those stories means understanding the empathetic impact that they have on one- and means also understanding the world view out of which they come. For example I am not a radical Catholic, but Robert Bresson's films have taught me a lot about a certain strain within the modern church. Occasionally a story can expose a darkness in a contemporary attitude- Quentin Tarrentino's films expose for me a darkness in the way that people empathise in our society for example. You may not agree with my examples- but the central fact remains true, stories change us and propel us, we need to understand what they propel us to- what sympathies they create. We need to understand that, both so that we can understand ourselves and so that we can understand each other. A central problem at the Nuremberg trial was, for those who do not remember it, a simple legal problem. Are you guilty of a crime if your excuse for committing it is that you were just following orders? It is a problem larger than the circumstances of Nuremberg merely- the trials established the principle in international law that you are guilty of any crime you commit, no matter the orders which force you into doing it. It is a philosophical problem whose pedigree stretches back in time- it was discussed for example during the Putney debates in the English Civil War. But it also has a contemporary salience- as the film La Veuve de St Pierre (the widow of St Pierre) describes. The film is set in the nineteenth century, 1849-50 to be precise, on the small French colony of St Pierre just off the coast of Newfoundland, the last remnant of French imperial possessions in North America. Two men murder an old fisherman. They are convicted: one of them dies swiftly following conviction but the other remains alive and is sentenced to the guillotine- which gives the title a double resonance, the guillotine in 19th Century French slang was called La Veuve- but the island has no guillotine and no executioner and so he has to wait, a prisoner, for the guillotine to arrive from Martinique and for an executioner to be found on the island. Whilst he waits he becomes an object of sympathy for the commander of the garrison's wife, played by Juliette Binoche. She befriends him, gets him to plant her garden and eventually turns him into a model citizen on the island. He rebuilds the roofs of houses, takes sledges around, stops carriages wrecking cafes, generally is a good help and a good man. He even finds a wife on the island- getting her with child and then getting married to her. This creates a good amount of gossip- what exactly binds the Captain's wife to the prisoner, furthermore it puts pressure on the Captain himself. He is accused of fraternising with a prisoner, eventually he is accused of neglecting his legal duty and of sedition. The point of the story is less the redemption of a murderer, than the difficulties that that redemption creates. The murderer is in my view redeemed far too easily- the message of the film could be caricatured as give up drink and all your problems will disappear. But that is not a realistic message. What is realistic, what does make sense is the dilemma that such a miraculous transformation has for two individuals that it really impacts upon- the Captain and his wife. They are caught between the town officials, keen that justice take its course and that the majesty of law and state be respected, and the local populace with their own inclinations, which do not see the point of executing a good man. That dilemma places them in a difficult position. At one point in the film, one character basically says that either the prisoner dies or you die- he is not at that point referring to the captain but he could as well be. The issue is that stark and it is the Nuremberg principle- at which point do you disobey what is an unjust order- at which point do you stop the process that leads to a crime by the state. The captain and his wife are in different positions here. For her sympathy is easy- it comes with no price- and her sympathy whilst it is more wideranging and impressive to the viewer of the film is also easier. She can afford compassion, she can afford to cry when the prisoner marries because his wife will soon be a widow. The Captain though has always a double pressure- his sympathy is constrained. The drama of the film is really the decision that he has to make about his future- does he lay down his life for a principle? Viewing the film in this way it makes much more sense. His love for his wife- which we see again and again through the movie- is weighed against his fears for her as a widow. His professionalism is weighed against his sense that this is the wrong thing to do and that he should stop it insofar as he has the power to, even if that delay or stop is ruinous for himself. In the end, he does make a decision- and from the first moment of the film when Binoche addresses us in the garb of a widow, we know what that decision will be. It is a brave decision and ultimately a futile one- but what it does is save his conscience at the cost of his life. The film places this story into a stark landscape of northern mist, fog and snow. This is a beautifully filmed film- Binoche gives the kind of sensitive and thoughtful performance that we have come to expect from an actress of her standing. Daniel Auteil playing her husband is as I have argued the most interesting character, but he also gives a fantastic performance and the rest of the cast is good too. 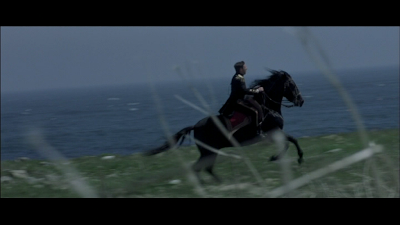 But it is more than that, the scenery and photography makes this a slow watch but an impressive one. Occasionally the director, one feels, has sacraficed speed for the enjoyment of a langorous shot of the landscape. There are some lovely movements with the camera, one can feel through the shooting the way that justice is often a matter of violence as much as of judgement. Foucault got that right in his histories of punishment and Leconte is eager to show us here, the impulsive violence that lies behind the system of courts and conviction. There is a semi-fascistic tone to this all, very much an emergence out of a France still reeling decades later from the memory of Vichy. Vichy permeates this film, it surrounds it and is embedded within it- indeed the point of the film is really about the responsibilities of minor officials when totalitarian or tyrannical government becomes the mode of the day. That has obvious resonances for European and world history in the 20th Century. Coming back to Nuremberg, the most interesting issue there was of course the futility of resistance. If I don't agree to take a job at Auschwitz, somebody else will. What La Veuve de St Pierre argues is that that doesn't matter. It is still important to take the right decision, no matter whether realistically it can have any effect. We should revel in those who contradict through conscience the mistakes of their state and their government. Reading the film as a tract against the death penalty locates the drama in the wrong place- the characterisation of the convict is too thin to warrant an impressive argument- reading it as a treatment of the Nuremberg issue makes much more sense of the film and is a much more interesting argument. Changing football clubs is normally something that football fans accept as part of life. Noone is neccessarily happy when they lose their best players- but whether its Cardiff City losing Ramsey this summer or Manchester United losing Ronaldo (if they do), it is something that happens to every football club and the alternative, that players would never move, would be a terrible idea. Equally though there are some transfers that just instantly strike you as wrong. Eight years ago, two Leeds fans were stabbed to death when the team travelled to Turkey to play Galatasaray in the UEFA cup, now one of the stars of that team has decided to move to Galatasaray. Harry Kewell in doing that has asked Leeds fans to move on and recognise the reality of modern football- that stars go where the money is, and that not to move would be to damage his career. Well Kewell may argue that, and some of the more idiotic Leeds fans would definitely be wrong to take out reprisals upon the Australian forward. 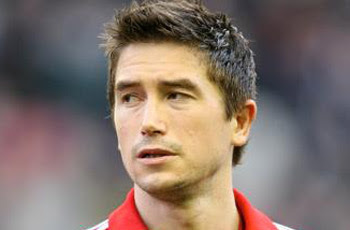 But it still doesn't alter the fact that what Kewell is doing is immoral. The fans of Galatasaray have not changed. Turkish football is still accompanied by unpleasant scenes and violence- for what is afterall only a game (anyone who says otherwise demonstrates that their idiocy is indeed authentic). There are two points here worth discussing: one is that morality still operates within the market. Just because someone offers you more money to do something, doesn't make that something right. It is an interesting thing to see, as soon as you do understand that principle, you can comprehend the fact that whenever a company performs an illegal or immoral act, those performing that act are culpable no less for the fact that they have been ordered to perform the act. Furthermore if corporate interest is not a moral defence, when it comes down to it ethics trumps economics. But why is this immoral? Well Kewell is moving to a side whose fans murdered people who had gone to Turkey in order to support him and his teammates. The position of fans in football is often taken for granted and ignored- they are told to grow up and shut up, until it comes to season ticket sales and replica shirts. Kewell has made a lot of money off the fans who support his activity- no matter that there is no legal obligation or no economic obligation, there is a moral obligation for him to reciprocate their loyalty. Over years at Leeds, Kewell was supported and cheered by the Elland Road faithful. To go to a club where some of them were murdered, a club that has never acknowledged that murder, is to slap them in the face. To go to a traditional footballing rival is a decision that is absolutely fine- rivalries in football are not serious- but murder is serious. And if we consider that a player has reciprocal obligations to those that support his work, then he ought to avoid such a symbolic identification with those thugs that have in the past attacked the supporters who lauded him. That this is immoral is beyond the question- Kewell shouldn't be banned from moving. Morality and law are different things in a liberal state. But that does not mean that he should not be condemned. The Australian has acted foolishly- and has acted in a way to demonstrate that money drives him, not consideration for others- like a corporate lawyer or a business man who makes their living from firing small people in order to replenish a good salary, Kewell has revealed himself to be longsighted enough to see the main chance, but blind to the moral judgements that he should be making.